This is a super tasty classic that is wonderful for Christmas or other meal. Chestnuts are high in carbohydrates and, strangely, very high in vitamin C, essential for the maintenance of blood vessels. Brazils are one of the fattiest nuts, and a rich source of Selenium, wonderful for bone health. 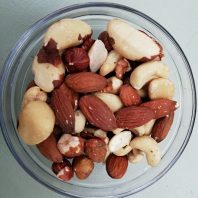 Other nuts are great too, a source of protein, as is quinoa (17%). Miso is a fermented food and good for gut flora. Really herby, everyone will be mmmmm-ing when they arrive in the kitchen, and so delicious they will be ommmming on the way home. Serve with classic Christmas veg and cranberry sauce. My adaptation from the Sivananda Cook Book. More illustrative picture coming soon; we keep eating it before the photo, doh! mix in the tomato puree to either the miso or chestnut/tamari stock and add to the other ingredients enough to bind them.